In the aftermath, people reviewing the incident thought the driver of the truck was likely misled by the design of the parking lot into thinking that he was turning at the appropriate location. Our investigation found that due to the height of the full-sized truck, the driver could not see what was directly to his right. When he turned, instead of turning into the exit lane, he turned over a curb and into the raised safety refuge. The little boy, his brother, and his mother had stopped at the store after swimming and enjoying a summer afternoon. When the mother realized that she had left her reusable shopping bags in the car, the boy remained in the middle of the safety refuge, and his mother quickly walked the few steps back to her car to retrieve the bags. The boy sat down briefly on the bark mulch in the safety zone that was marked off by a yellow painted curb, while his brother stood between him and his mother. 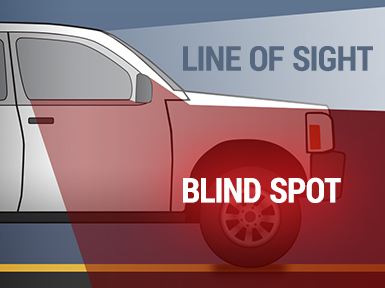 A full-sized pickup truck, turning at a stop sign in the parking lot, was driven up and over the curb and into the pedestrian area where the boy was sitting. The truck hit and killed the boy. The case against the driver was eventually settled for policy limits. This entry was posted in October 2016, Pedestrian & Bicycle Collisions, Tort Tips, Wrongful Death. Bookmark the permalink.